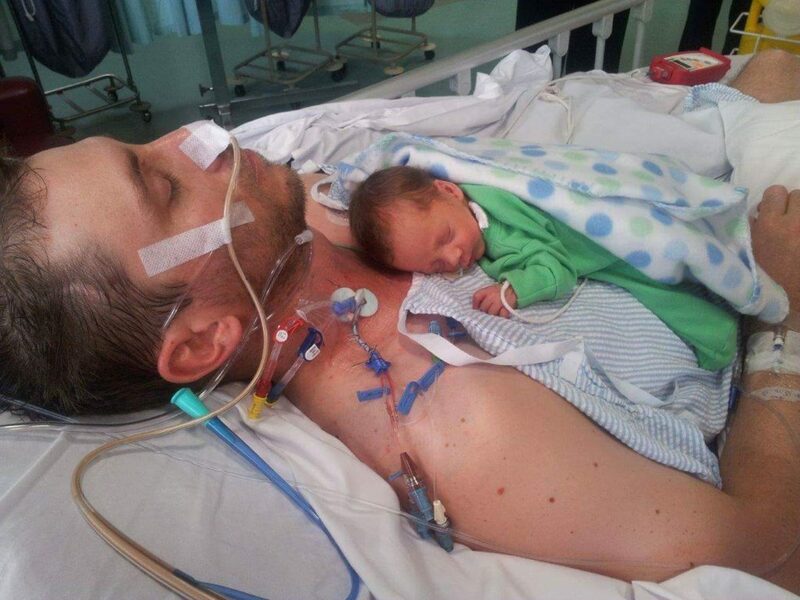 Prior to receiving a vaccination (a dTpa shot) Australian father-of-five Ben Hammond (pictured below with his newborn baby boy) was fit and healthy and working to support his family. The photo above shows Mr. Hammond in hospital following his life-threatening adverse reaction. As you can read below (in text which is sourced from a recent newsletter of the Australian Vaccination-skeptics Network) Ben Hammond has been unable to work since developing a severe vaccine-associated illness . While in NZ, people who suffer the type of vaccine-injury that Mr. Hammond experienced should be eligible for compensation to cover medical treatment and most of their lost earnings from ACC, in Australia, there is no such scheme. Mr Hammond is therefore undertaking legal action against the WA government hospital that told him that he would not be able to visit his fifth child (who was in hospital due to his premature birth) unless he agreed to receive the dTaP vaccination. Please read below for full details of this case, and consider donating if you can and/or sharing this link so that other people can learn about this case. Thank you. Also: For information regarding vaccination, please click on this link to learn about an online docu-series which is FREE for a limited time. A pre-trial conference regarding this matter has been set down for 24 July 2017. To this end, we are asking our valued members and supporters to support Ben Hammond in his quest to raise funds for the cost of obtaining expert reports, which, he has been advised by his pro bono legal team, are absolutely necessary in order to win this David and Goliath battle. His wife and carer, Tanya, has created a GoFundMe campaign for this purpose, which we have reproduced below for the benefit of those not familiar with Ben’s story. Ben was a hard-working miner, husband, and primary provider for his family when he was struck with a life-threatening paralytic vaccine reaction shortly after his youngest child was born prematurely. Before being allowed to see his newborn son, he was required to have a dTaP vaccine on the basis that this would allegedly protect his newborn and other newborns in the special care nursery, where his premature son was being cared for. Unfortunately, it was this shot which landed him in the same hospital as his son, fighting for his life as a wave of paralysis crept up his spine, stopping his heart two separate times. What was supposed to protect his son almost separated son and father forever. ADEM stands for Acute Disseminated Encephalomyelitis, an autoimmune condition affecting the central nervous system (brain and spinal cord). Amazingly Ben survived, and spent a lengthy period in rehabilitation, eventually learning to walk again, albeit unsteadily. However, the autoimmune reaction that attacked his spinal cord caused permanent harm, and he lives with the ongoing effects of damage to the function of many of his systems, and is unable to provide for his family. Despite being unable, so far, to obtain government or other compensation for his injury, Ben and his wife lived off savings and family help for a couple of years until they hit a financial wall. Their house in foreclosure, Tanya full-time caring for Ben, and their bills piling up, they swallowed their pride and turned to the public for help. The wonderful generosity of their donors has kept the Hammonds in their home, and able to both buy medical supplies and put food on the table for their five kids. Their last GoFundMe aimed to raise money for a move from Kalgoorlie to Perth, where they could be closer to more advanced healthcare services and support from extended family. This is still their goal, but has temporarily been put on hold while the more immediate costs of living need to be covered, and the family awaits an upcoming court date. The Hammonds want to say a big thank you to everyone who has kept them going over the last two years, and in humility ask for further assistance knowing there are many others who are also struggling. For those who can help, it would mean so much to them right now. As some would be aware, Ben is currently engaged in litigation against the WA government hospital that administered the vaccine to him, and whilst his legal team are generously acting for him in a pro bono capacity, this does not extend to the costs of obtaining the necessary expert reports required to succeed. These expert reports don’t come cheap. After four long years, the Hammonds are finally standing right before the finish line and we can help them get the justice they have been fighting for all this time. If Ben is successful in his litigation, it will be a watershed for vaccine injury law in Australia. You need to know that in helping Ben to win his case, you will not only be delivering to him and his family a much-deserved personal victory. You will also be delivering a big win to our entire community! If Ben is successful in his litigation, finally there will be accountability in Australia for the real harm that vaccines can cause – hospitals and government departments will know that they can be held responsible for harming people with their coercive policies around vaccination and they will no longer be able to walk away scot-free! Please give whatever you can afford. Every little bit counts. Let’s get the Hammonds across the finishing line! Donations may be made via GoFundMe. Ed note: The NZ Journal of Natural Medicine features articles about various aspects of health, including vaccination, nutrition, herbal medicine, protection from electromagnetic radiation (EMR) and many, many more.